I know Christmas is fast approaching, but I am hoping that Santa still has some room in his sleigh for some of these polishes for me! 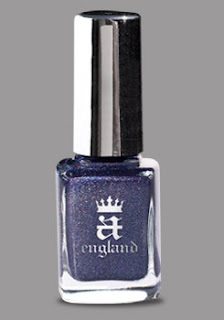 A-England is a brand of nail polishes that just scream beauty and fantasy. So far, their collection of polishes, called the Mythicals are named after English legendary characters and places such as: King Arthur, Excalibur, Merlin, Morgan Le Fay, Iseult, Guinevere, Elaine, Lady of the Lake, Tristam, Lancelot, Camelot, Avalon, Perceval, Galahad, Holy Grail, The Knight (basecoat), and The Shield (topcoat). The website also has a glossary of all the names which I also totally love! When I saw they have Iseult I could barely contain myself! *MUST HAVE* Iseult is another version of Isolde for those not in the know. A-England's Iseult is a light pink which they describe as 'delicate romantic pink with opalescent pearly reflection.' Hm... while that sounds pretty, it's not usually what I go for on my nails. I do like the sound of the opalescent pearly reflection though. I think I really need to see this in person before I'm convinced, but I *love* the name! I do love Guinevere as well, such a gorgeous colour! That's actually one of my favourite names and it's on my secret list of names I'd love to name my children! There's also an Elaine, which is my mom's name, but sadly it's a bright purple and well, that's not really her colour either, otherwise I would have been totally tempted to get it for her! I couldn't end this post without looking at Tristam (get it? Tristam and Iseult?) I think this is my favourite of them all. It just looks so lovely! Update: I finally got my hands on Tristam! So Santa Baby, I've been pretty good this year!